This 1923 article in the Niagara Falls Gazette describes the origins of an English-style inn in Niagara Falls, NY. The story is unusually lengthy and smoothly written. 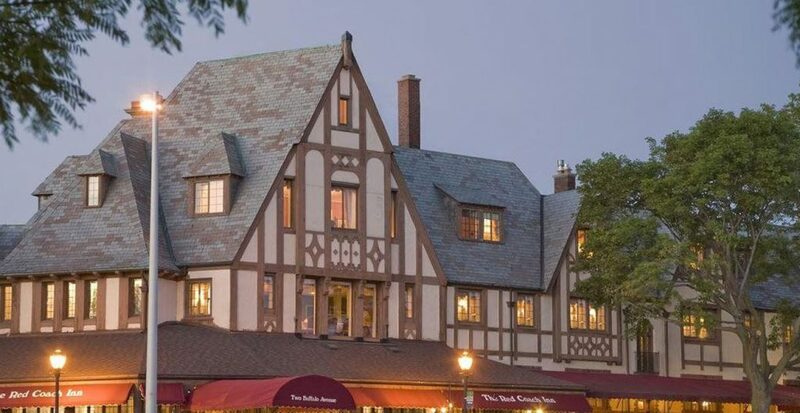 It illustrates well the continued, nay enhanced, appeal of the “olde English inn” in American social life by 1923. In that year, a hotel was erected on the site of a demolished German-American hotel, the Kaltenbach, renowned locally and beyond since the mid-1800s. The new place was – and is – called the Red Coach Inn, perched above the high rapids a few hundred yards from the American Falls. The design motifs of an earlier English period, via Tudor Revival, had a strong appeal due to the implied gentility – social status in a word. While the cozy English taproom had to be left out due to Prohibition, the Red Coach Inn otherwise gave full vent to the old English hostelry of American imagination. Mounting a circular staircase to the second floor the guest is ushered into a most inviting parlor off which there is a ladies’ retiring room. The furnishing of this suite of reception rooms is rich and striking, the lounges and chairs being in quaint old fashioned chintz, the walls in panels delicately tinted in soft, harmonious colors. The same holds true in the guest chambers throughout the inn. The walls are adorned with rare old English prints. On this floor is the French dining salon which is a dream of quiet refinement. The color motif on walls, panels and ceilings is French grey, the hangings in chintz and the tables and chairs in old colonial style. The china and silverware were made expressly for this establishment, all china having a picture of the coach and four with the words “Red Coach Inn”. The silverware, as well as the blankets, spreads, towelling, bed and table linen, have the monogram of the inn marked on them. The bedrooms are designed to furnish every comfort to the guest. The furniture is actually sumptuous. The beds in single and double are in Tiffany bronze effect with rich floral ornamentations. The dressers and other appointments are of like character. The images in sum evoke conceptions of genteel English country life and storied Colonial days, all suggestive of a fixed social order, serenity, and a timeless beauty. (The reality was quite different, but that is a different matter). There was a Red Coach Inn in Niagara Falls, NY in the early 1800s when coaching inns were important in American life, so building a new one had more justice than often accompanies such projects. In any case, using building and decorative styles of recognized authority conveyed gravitas and status, an idea as old as the hills. In a later period, Victorian styles were borrowed to similar effect (1960s until today). 1923 was too early, though, to recognize Victoriana in this way. By the 1930s the English inn or tavern idea had burgeoned and inspired new or renovated restaurants, bars, and hotels, to please the aspirant classes and extract lucre from their expanding pocketbooks. In the classic American way, it was win-win. Everybody Was Happy. With the arrival of Repeal in 1933 the Red Coach Inn could now serve liquor. The hotel went from strength to strength, taking advantage of its location and concurrent growth of Niagara Falls as Honeymoon Capital of the World. Indeed the hotel is still going strong today, pictured above are two images from its website. A final, and rather local note: the Gazette noted that the hotel manager, who had also superintended the Kaltenbach hotel, had many friends in Toronto and anticipated their patronage of the new hotel. This supplies another clue why the British motif was selected rather than continuing the site’s earlier German flavour. In American eyes then and until relatively recently, “Canada” was a cipher for “British”. Bearing in mind too that things Teutonic were not exactly in style after WW I, it made sense to “think British” as the next stage to maximize the appeal of a hotel on the Falls. With America maturing as a nation, coming out of WW I as an ally of Britain, the old enmity viz. John Bull that emanated from the American Revolution had subsided. Britain was now unequivocally a social and cutural model, as indeed American literature and many American social and cultural practices had long recognised, or reflected tacitly. August Janssen, a German-American restaurateur who owned the famed Hofbrau Haus in Manhattan, did something similar on the eve of WW II in 1939. 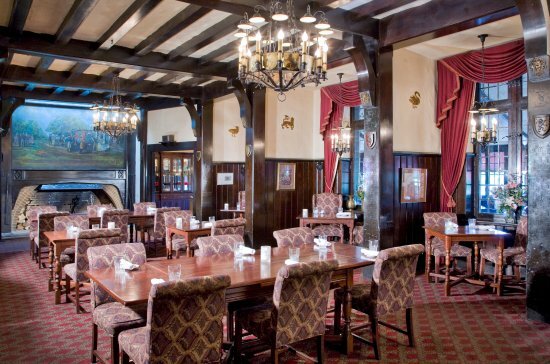 He created an old English tavern as sister-establishment to his baronial Haus. In his case, the German place continued with the other. More soon. Note re images and quotation: The images and quotation above are from sources identified and linked in the text. Material is used for educational and historical purposes, and for fair comment. All intellectual property therein belongs solely to the lawful owners, as applicable. All feedback welcomed.